PGIMER Recruitment 2019: Postgraduate Institute of Medical Education & Research (PGIMER), Chandigarh / pgimer.edu.in is conducting recruitment processes to fill 21 vacancies. As of now, there are ten recruitment drives going on for Technician B Post, Walk in for Junior Research Fellow Post and others. PGIMER Recruitment 2019 - Job notification for Technician B Post in PGIMER, Ludhiana, Punjab on Contract Basis. Applications are invited by Postgraduate Institute of Medical Education & Research (PGIMER), Chandigarh on or before 30 Apr 2019 for 1 vacancy. PGIMER Recruitment 2019 - Walk in for Junior Research Fellow Post on a project entitled “Evaluation of different rapid molecular methods for the diagnosis of mycobacterial infections (M.tuberculosis &NTM) and to study the various mechanisms of drug resistance due to Mycobacterium tuberculosis in patients of suspected tuberculous meningitis.” in Department of Medical Microbiology, PGIMER, Chandigarh on Temporary Basis. Candidates are invited by Postgraduate Institute of Medical Education & Research (PGIMER), Chandigarh to attend walk-in-interview to be held on 07 May 2019 at 03:00 PM for 1 vacancy. PGIMER Recruitment 2019 - Job notification for Project Coordinator, Lab Attendant & Other Posts on a project entitled "Concurrent Evaluatit Population Based NCD Screening under National NCD Programme in 5 districts of Haryana" in PGIMER, Chandigarh. 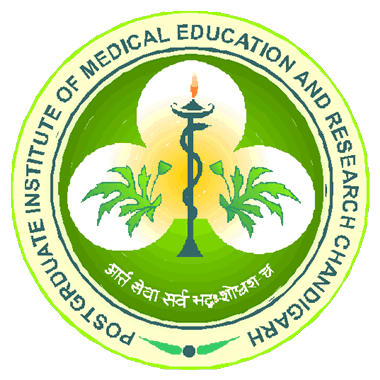 Applications are invited by Postgraduate Institute of Medical Education & Research (PGIMER), Chandigarh on or before 22 Apr 2019 till 05:00 PM for 5 vacancies. PGIMER Recruitment 2019 - Job notification for Project Scientist Post on a project entitled “Evaluation of BMW Generation, Gap Analysis with Respect to Coverage Area and Future Projection in Haryana for Better Management” in PGIMER, Chandigarh, Punjab on Contract Basis. Applications are invited by Postgraduate Institute of Medical Education & Research (PGIMER), Chandigarh on or before 22 Apr 2019 03:00 PM and Interview held on 24 Apr 2019 10:00 AM for 1 vacancy. PGIMER Recruitment 2019 - Job notification for Research Assistant Post on a project entitled “Evaluation of BMW Generation, Gap Analysis with Respect to Coverage Area and Future Projection in Haryana for Better Management” in Department of Community Medicine & School of Public Health, PGIMER, Chandigarh, Punjab/Haryana. Applications are invited by Postgraduate Institute of Medical Education & Research (PGIMER), Chandigarh on or before 22 Apr 2019 for 2 vacancies. PGIMER Recruitment 2019 - Job notification for SRF Post on a project entitled "Development of an endoscopic catheter mounted impedance probe to assess real-time mucosal permeability" in Department of Gastroenterology, PGIMER, Chandigarh, Punjab on Temporary Basis. Applications are invited by Postgraduate Institute of Medical Education & Research (PGIMER), Chandigarh on or before 24 Apr 2019 at 03:00 PM for 1 vacancy. PGIMER Recruitment 2019 - Job notification for JRF Post on a project entitled "Pathogenesis of Osteoarthritis: Integrated approach it based on transcriptome, proteome, micro RNA some analysis during the progression of knee osteoarthritis." in Department of Biochemistry, PGIMER, Chandigarh, Punjab. Applications are invited by Postgraduate Institute of Medical Education & Research (PGIMER), Chandigarh on or before 23 Apr 2019 at 11:00 AM for 1 vacancy. PGIMER Recruitment 2019 - Job notification for JRFs Post on a project entitled "Pathogenesis of Osteoarthritis: Integrated approacit based on transcriptome, proteome, micro RNA ome analysis during progression of knee osteoarthritis." in Department of Biochemistry, PGIMER, Chandigarh on Contract Basis. Applications are invited by Postgraduate Institute of Medical Education & Research (PGIMER), Chandigarh on or before 23 Apr 2019 till 11:00 AM and Interview to be held on 23 Apr 2019 at 02:30 PM for 1 vacancy. PGIMER Recruitment 2019 - Walk in for JRF Post on a project entitled "Proteomic analysis of renal amyloidosis and genotyping of SAA positive amyloid" in Department of Histopathology, PGIMER, Chandigarh on Contract Basis. Candidates are invited by Postgraduate Institute of Medical Education & Research (PGIMER), Chandigarh to attend walk-in-interview to be held on 23 Apr 2019 till 02:30 PM for 1 vacancy.